Situated 42 km from Jaisalmer in Rajasthan. 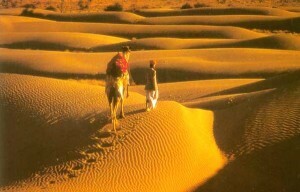 No trip to Jaisalmer can be completed without a trip to the most picturesque dunes of Sam. The ripples on the wind-caressed dunes, that create an enchanting mirage, are surely a delight for a trigger-happy photographer. Various cultural programmes are organized against the backdrop of these fascinating sand dunes. Exciting camel safaris allow you to get the real feel of the desert on the camel back. The sun set over here unforgettable. This entry was posted in Rajasthan, Sam and tagged about sam, camel safari. Bookmark the permalink.